SUMMARY: Excellent performance, fairly quiet. The good guys at Thermal Transtech were nice enough to send the TTIC-NPH-101 heatpipe for a test spin. This is a two fan heatpipe; the major difference from other heatpipes I’ve seen is that the heatpipe is fairly large – it measures 25.4 mm x 100 mm long. 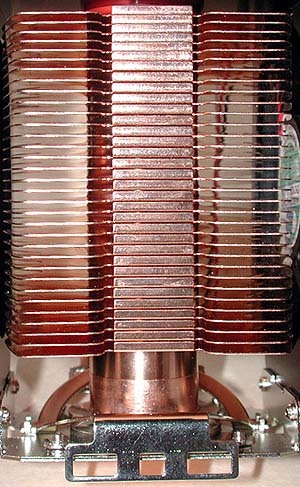 There are 34 fins arrayed along the heatpipe, with two fans for cooling (push-pull configuration). This is the Socket A version, but the heatpipe is the same. The bracket mounts to the back of the motherboard and is a snug fit. The screws can only tighten so far, so there is no real danger of unduly flexing the motherboard. Overall, a good system. There are two 70 x 15 mm fans spinning at 3622 and 3733 rpm. I found them to be tolerably quiet – I measured noise at 59 dBA¹ with a Radio Shack sound meter 8″ from the fan’s intake, substantially less than a Delta 38 (about 69 dBA). It’s also safe to use a motherboard fan headers (3.4 watts each). When I ran my nail over it, I could feel ridges; a good lapping could improve results somewhat. I tested the TTIC-NPH-101 on an Acorp 4S845A motherboard with a modified P4 1500 to read CPU case temps. Motherboard results place the TTIC-NPH-101 in the top rank of heatsinks (Heatsink Ranking) tested to date. This is the second best performing heatpipe I’ve tested to date. Heatpipes have been used in notebooks for some time and are now successfully migrating to the desktop. Thanks again to Thermal Transtech for sending this our way. Previous Article Does Anybody Want This CPU?